Our star the Sun overhead is approaching the Tropic of Cancer, oceans in the northern hemisphere continue to get warmer, and the atmosphere above is populated by tropical waves and disturbed weather cells with increasing frequency. As this is happening in the coupled ocean-atmosphere environment conditions are gradually becoming more favorable for cyclogenesis. Today, Tuesday 10 June 2014, there are two active tropical cyclones at opposite regions of the world, in the eastern Pacific ocean off the coast of Mexico and in the Arabian Sea, northwestern Indian Ocean, between India and Oman some 1000 km south of Karachi, Pakistan. At the same time there are large disturbed weather cells over the northern Philippines Sea near Taiwan, in the western Pacific aiming for the Philippines, and over the eastern Atlantic south of the Cape Verde Islands, all of this while yet another wild storm rampages over the United States from the south to the northeast. The mosaic of satellite images shown below illustrates this activity. 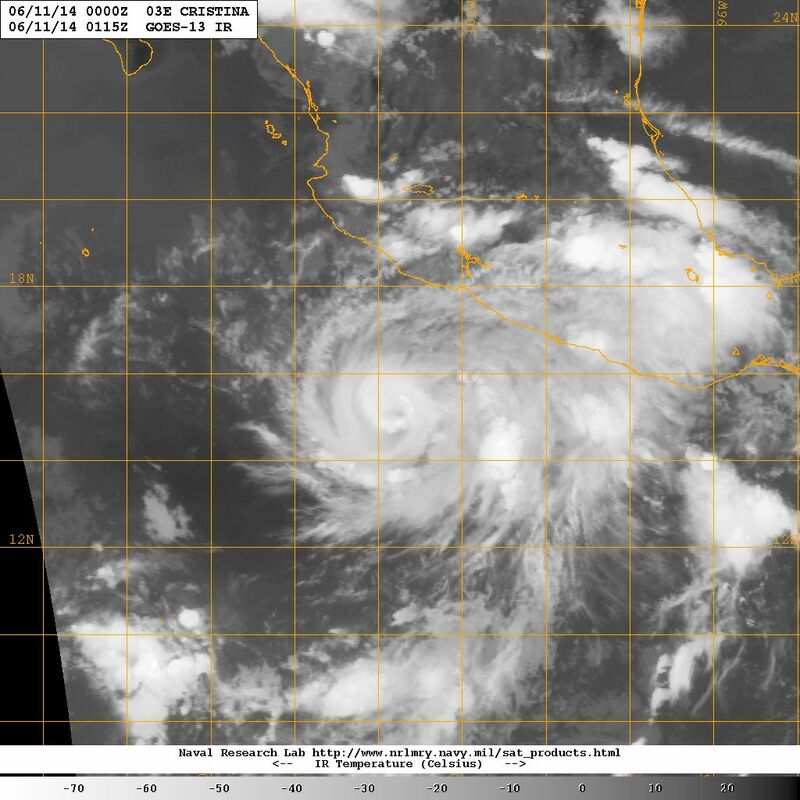 Tropical storm CRISTINA, the 3rd named tropical cyclone of the 2014 east Pacific hurricane season is some 900 km west of Acapulco, Mexico moving toward the NW away from land, but it is still generating quite a bit of rain over the coastal region of central and south Mexico. The other active tropical cyclone in the northern hemisphere today is the second one to generate over the Indian Ocean. This one is actually over the Arabian Sea, a region that sees its share of violent storms, but not that much cyclonic activity on an annual basis. Most models show this storm moving WNW toward Oman. All interests around the Arabian Sea in Oman, Iran, Pakistan and India need to monitor this storm closely in coming days. 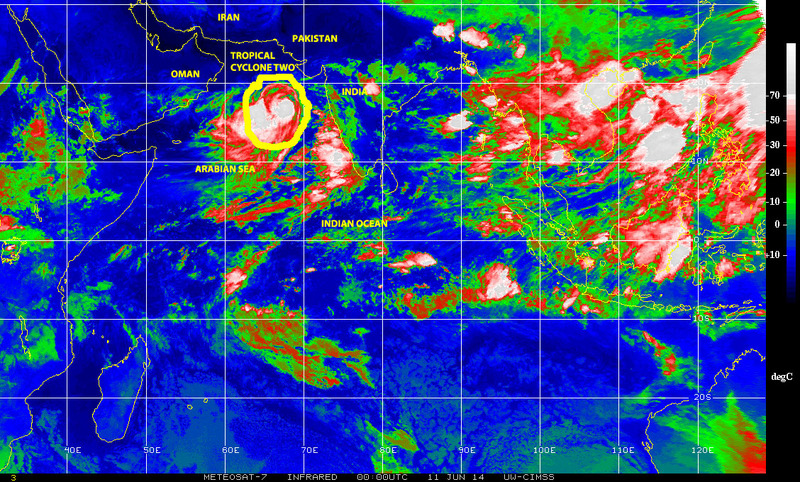 Satellite image below illustrate this storm’s location. Color-enhanced infrared satellite image of 10 June 2014 showing Tropical Cyclone TWO over the northern Indian Ocean, in the Arabian Sea. 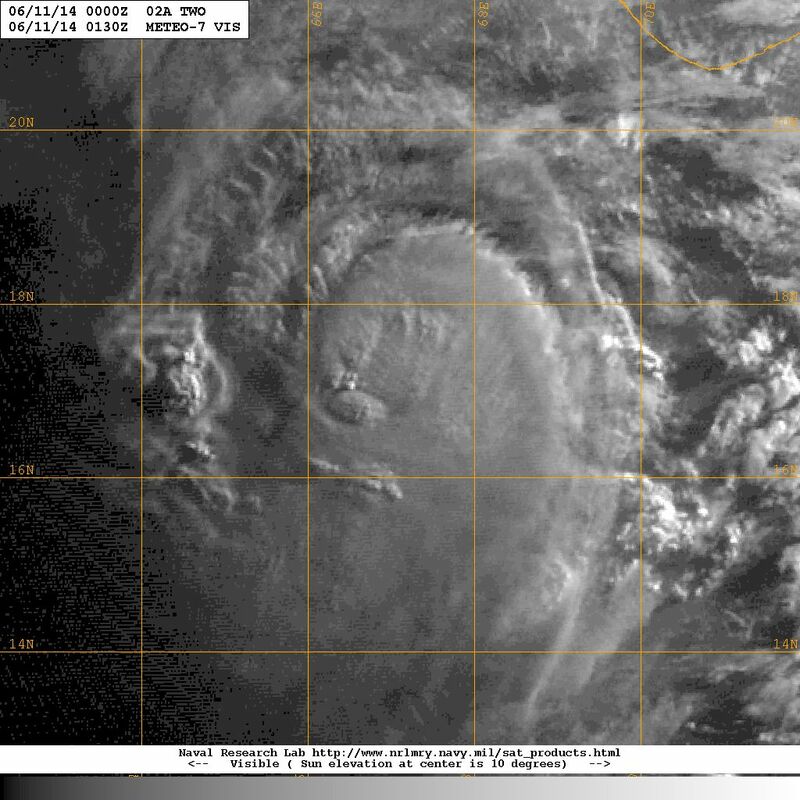 Visible light satellite image in the early morning hours of Wednesday 11 June 2014 showing Tropical Cyclone Two over the Arabian Sea, Northern Indian Ocean. Farther to the east over the Northern Philippines Sea, in the northwestern Pacific, a rather large and strong low-pressure system is north of the Philippines and west of Taiwan generating copious rainfall and extreme weather over a wide region. This system is showing a propensity for further even cyclonic development in the next day or so. All interests in the region, from the Philippines, to Taiwan, China, Korea and Japan need to monitor this one closely. 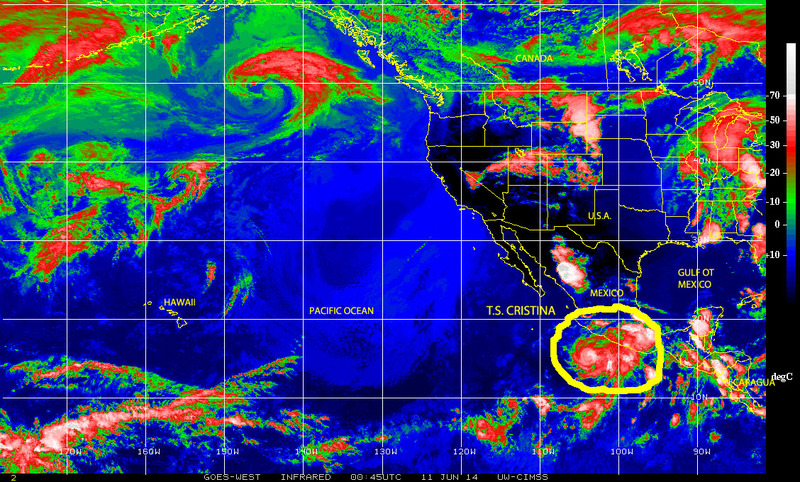 Satellite image below illustrates the location of this system, designated as INVEST 94W. 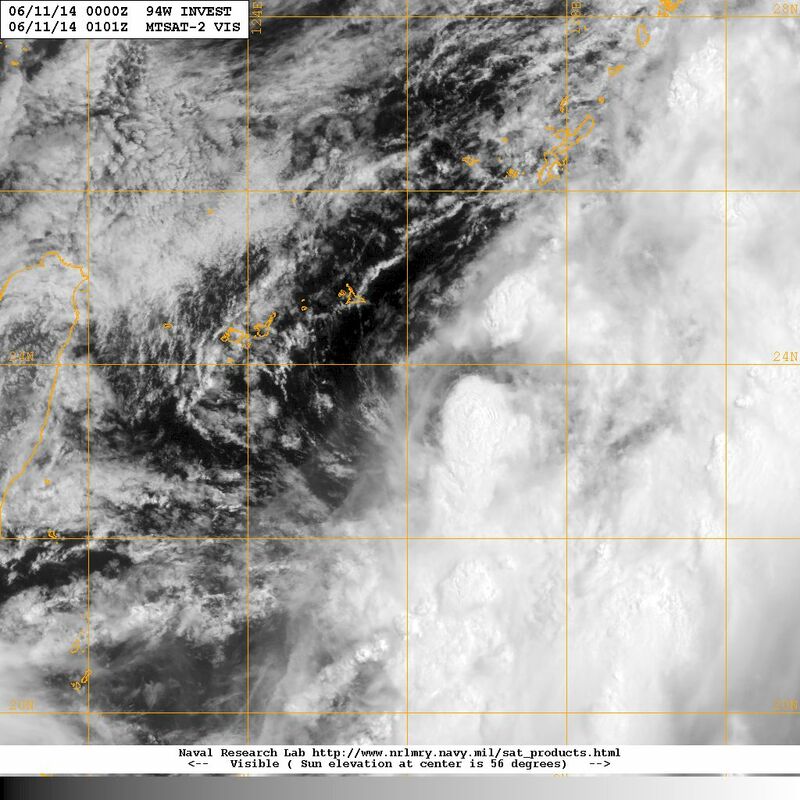 Color-enhanced infrared satellite imagery of 10 June 2014 showing INVEST 94W, a low pressure system being monitored for possible cyclonic development over the northern Philippines Sea. 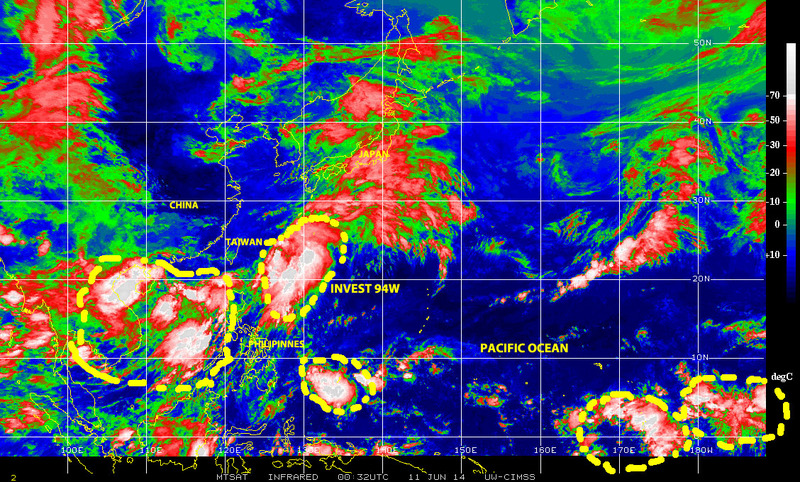 Other disturbed weather cells over the larger region are also shown. Closer to our neck-of-the-woods here in Florida and the rest of the hurricane-vulnerable U.S.A. we are having disturbed weather as a result of a large storm moving from the south to the northeast, which has been generating severe storms, tornadoes, and intense and frequent lightning strikes over several states since yesterday. Also of interest for this region, as well as for the Caribbean and Central America larger sub-basin, there at a distance over the far eastern Atlantic to the south of the Cape Verde Islands, there is a large and elongated tropical wave that had emerged from equatorial Africa over the warm Atlantic waters and has started to travel westward along the southern boundary of ‘hurricane alley’. 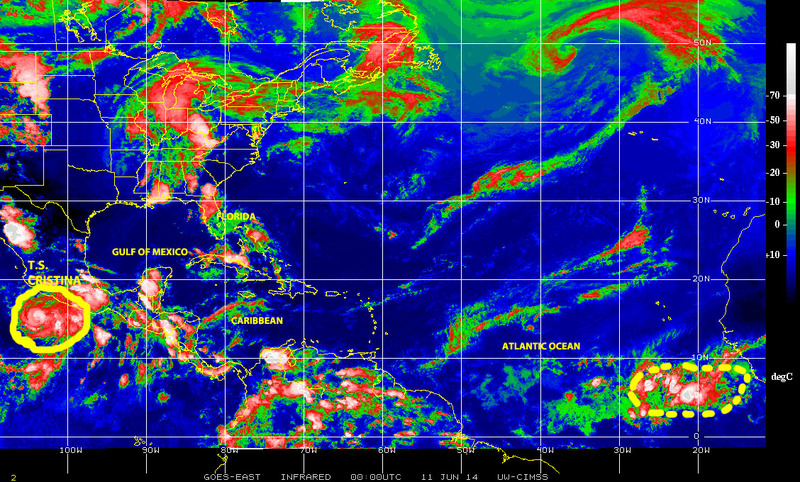 Nothing major at this time, but a sign that the tropical-wave conveyor over equatorial Africa might be steering up. Another sign that the northern hemisphere tropics are getting more active with each passing day as we move toward the summer solstice in a few days. This is just Mother Nature in one more annual cycle, doing what She does in its constant search for balance between extremes. This is something we have come to expect every year, so no surprises here. Let us keep alert, remain prepared and engage in the practice of MITIGATION! Keep in mind, it doe not matter if the ‘prediction’ is for a ‘below average’ or ‘less active’ 2014 Atlantic hurricane season, all it takes is one impact by a hurricane to cause plenty of damage, loss of property, plenty of human suffering, and possibly death and injury. 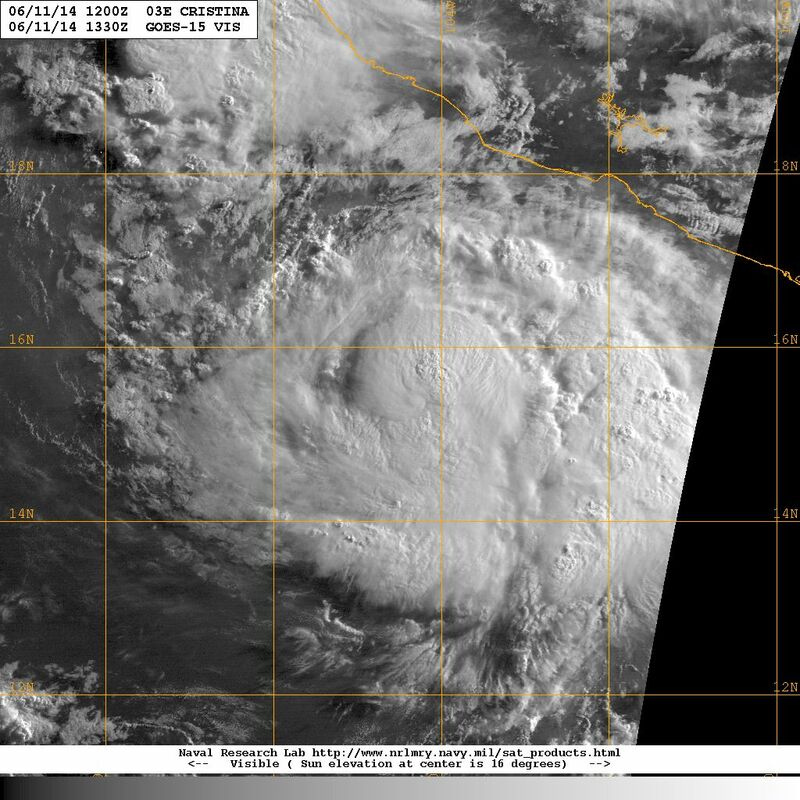 Tropical storm CRISTINA strengthened during the night and it is now a category 1 hurricane (in the Saffir Simpson hurricane wind scale) moving generally westward at 10 kph, away from the Pacific coast of Mexico, with maximum sustained winds of 120 kph (75 mph). The tropical cyclone is tracking over a favorable ocean-atmosphere environment that will most probably promote further strengthening over the next 24 – 48 hours. While the storm is moving away from land it is still generating plenty of rain over the coastal region, which may lead to flash flooding and potential damage to infrastructure and risk for life in the area. 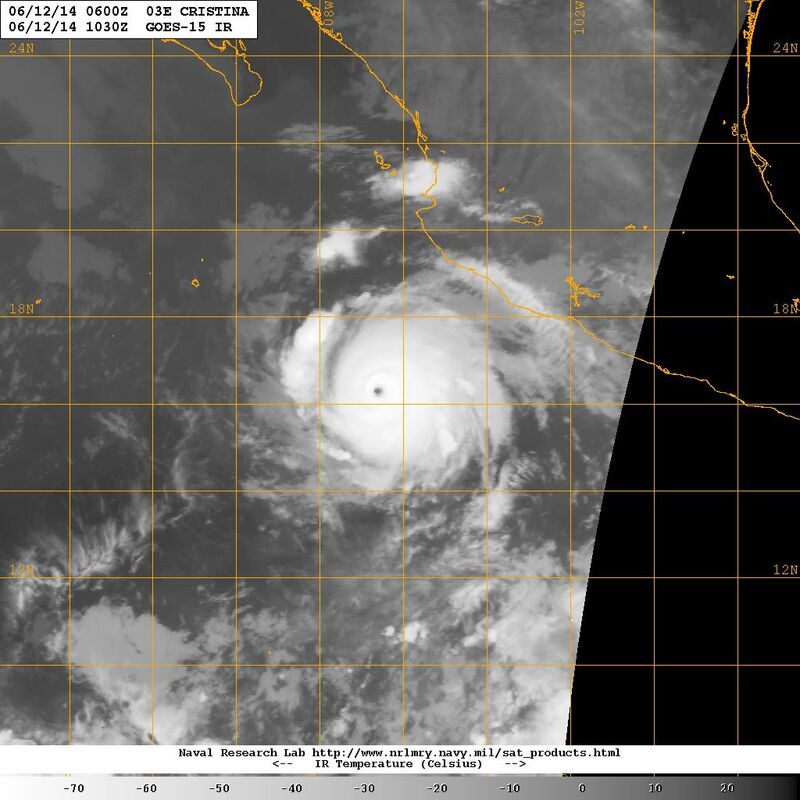 Hurricane CRISTINA is now a strong category 2 tropical cyclone with sustained winds of 195 kph (120+ mph) and much higher gusts as it continues to move generally toward the NW away fro the Mexican Pacific coast. The storm continues to track through an ocean-atmosphere environments that favors further strengthening over the next 24-36 hours. Satellite imagery and map below depict current conditions and track for this storm.